Uses: Elementary School, Health Care, High School, Middle School Colors: Blue Lengths: 7 panel 13'-1" Heights: 6'-0"
Screenflex offers a variety of privacy screens for use by healthcare, disaster relief, and education professionals, or for anyone in need of quality privacy panels. 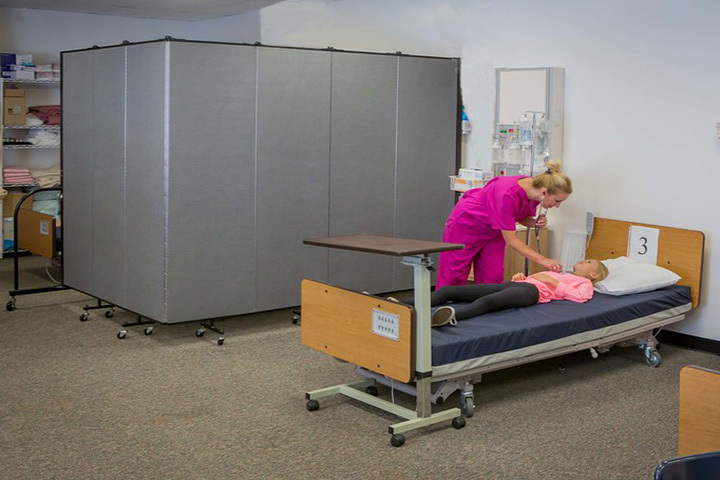 Our medical partitions easily move on self-leveling casters to offer you the ability to set up the screens wherever you need to protect patient privacy. Glides can replace the casters when necessary for stationary use. The Screenflex standard room divider (as seen above) comes with u-shaped end frame making it easy to move the divider. Choose from 6 heights and 6 lengths to customize your room divider size. Each panel is covered with your choice of one of our 38 fabric or vinyl coverings. Additionally, we offer a Healthflex Room Divider for our customers. Healthflex dividers are available in 5’9″ tall and come in a 3 panel (5’9″ long) or a 5 panel (9’5″ long). Choose from 25 different colors of vinyl or colored SmartSheild antimicrobial surface protected fabric. The Helathflex unit has an ultra low profile end frame that requires minor assembly.